The sunshine shone brightly for our summer event in Cambridgeshire, in a day brimming with lido love! The setting was the impressive Peterborough Lido, where we enjoyed an insight into its fascinating history, before hearing about the stories of two other pools at different stages in their journeys. Like all our members, Peterborough Lido has its own unique story to tell. Following a competition that saw a number of architects working together on the design, it was in 1936 that the lido was completed. Its history and ability to overcome many challenges since opening, including a bombing in 1940, a fire in 1991 and extreme financial pressures during the 1990’s, is a reflection of the spirit of the lido and the resilience of those who have championed its existence. This enduring spirit is now captured by the Friends of Peterborough Lido, a group recently set up to support this “gem in the midst of our City” replete with its Mediterranean architecture, landmark clock tower and wonderfully laid out sun decks. 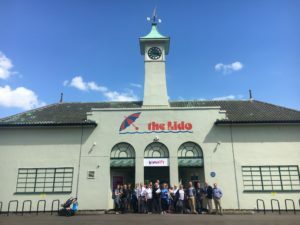 The Friends are now working in partnership with Vivacity, a not-for-profit organisation that was established in 2010, and has been managing the lido on behalf of the City Council since 2011. With a new café, pool liner, filtration system, play area and cubicles completed, plus a new boiler and heating system planned for 2018, there is lots going into making the swimming experience for the 20,000 people who visit the lido during its open season a truly fabulous one. We were all delighted to learn more about the fantastic Jubilee Park outdoor pool in Lincolnshire, gaining a valuable insight into its extremely successful working model. Taking its name from the jubilee of George V in 1935, the lido enjoys a stunning location in the beautiful rural village of Woodhall Spa. It is part of a delightful camping and caravan site in park gardens with tennis, cricket, bowls and croquet as part of the experience, making this is very much a destination lido. The lido faced tough times in the late 2000’s when the threat of closure hung over it. 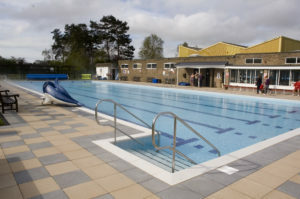 Investment in the pool and site took place, as did the establishment of the not for profit Jubilee Park Woodhall Spa Ltd as the operator, and it is now entirely self-supporting with no public funding. Jubilee Park works hard to integrate its activities with the local community, has made great strides with its programme of swimming lessons and delivers a packed events calendar, from a 1940s weekend to cinema screenings, giving people lots of reasons to keep visiting! The park has also made its processes for swimming a model of efficiency. There is a system for dealing with busy days and working around the challenges of staffing hours, an online booking system and a series of initiatives that have been developed to appeal to different swimmers and their unique needs. 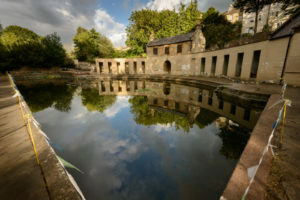 The Chair of Cleveland Pools, Paul Simons, was able to share an update with guests on the ongoing quest to secure funds to restore the Georgian riverside pool. An extremely complex project, that community campaigners have worked on tirelessly for over 14 years, the Trust is stepping positively forwards with the next step in its plans, following on from HLF funding disappointment at the end of 2017. Peterborough Lido was also the setting for the launch of Historic Pools of Britain’s partnership with the Lido Guide, which you can read about here. Our next event will take place in October 2018. To register your interest email info@historicpools.org.uk.